One of the most fundamental factors for NIKE, Inc.’s business is to improve working conditions to the sporting world. The three main product lines of Nike’s brand are as followed: footwear, apparel and equipment. The Nike Company has approximately 600 contract factories that employ more than 800,000 workers in 46 countries around the world. Nike is the leader of their industry. This awesome advert below shows a perfect example of their main product, the Nike running shoe, watch it now! Nike is now, more than ever, introducing new innovative products for the digital world. Over the past few years Nike has created powerful fitness tracking devices, such as the Nike+ FuelBand which comes with an app to use on your phone. They also introduced the Nike+ SportWatch GPS which also comes along with it’s own phone application to track runs and provides a GPS routing system. These new fitness tracking devices are becoming very popular with the ever growing force field of technology. Here is a list of all the Nike products to are fueled to the world of technology, we will discuss those below. Of course as I was stating before, there is the Nike+ FuelBand SE. This device tracks your active life by measuring all of your movement throughout the day. You can also download the Nike+ FuelBand Application for your mobile phone. You can track your active progress through your phone and share with your friends. It’s a great way to keep up with your fitness goals and keep your motivated. There is also the Nike+ SportWatch GPS which I also mentioned above in the article. This SportWatch is designed for avid runners who take it up a notch. You can track GPS, take splits and even reminds you to run. It can even remember your PRs. The Nike+ SportWatch also comes with an application for your phone. You can download the Nike+ Running App to track your runs and progress. No sensor required. It is available for Android and iPhone. Nike+ has also rolled out a iPod Nano Nike+ feature so you can turn your iPod into a Nike+ device where you can get audio feedback on how you’re doing as you run along to music. That’s pretty cool, huh? Another innovative product Nike+ has produced is the Nike+ Kinect Training system for Xbox users. You can get a customized workout program, benchmark your progress with Fuel Print, workout live with your friends, and complete goals, all from your living room at home. The best thing about the Nike+ Kinect training is that it evolves your workout as you make progress. You may also want to check out the Nike+ Training Club. This is a personal trainer on your mobile device. Anytime, anywhere. You can get fit with full body workouts, 4-week programs and track your progress in number of workouts, minutes, average calories and NikeFuel. 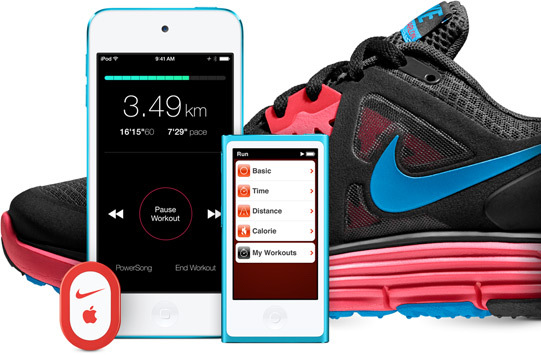 Nike+ Training Club is an application that you can download onto your phone or tablet. It’s worth looking into. So, as you can see Nike is not just about footwear and apparel, Nike is really stepping up their game to a whole new level with newer and more innovative products than ever before. It’s very exciting to anticipate what will Nike bring to the industry next. While Nike growing and rolling out new technology to help fitness and athletes alike, don’t forget that Nike is the world’s most popular brand for fitness gear and footwear as well. I also wanted to go over some of the top series of footwear and fitness sneakers that Nike provides. Air Force 1’s are always the classic go-to shoe when it comes to Nike footwear. The classic all white sneakers produced by Nike are a staple in style and fashion. The Air Force 1’s are not really designed for high-impact workouts, but can be used for lower-impact workouts. However, Air Force 1’s are mainly designed for casual wear. 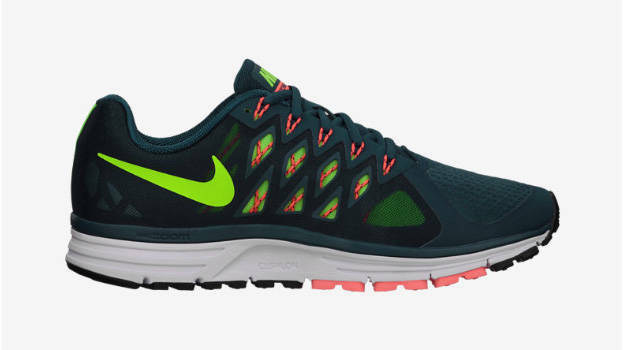 Nike Air Zoom Vomero is a very popular shoe with avid runners. It was designed with a mesh in the upper area of the shoe with cutouts for more breathable space to allow air flow to keep your feet cool and dry. The shock absorbency from the rubber cushion sole also allows for great traction. 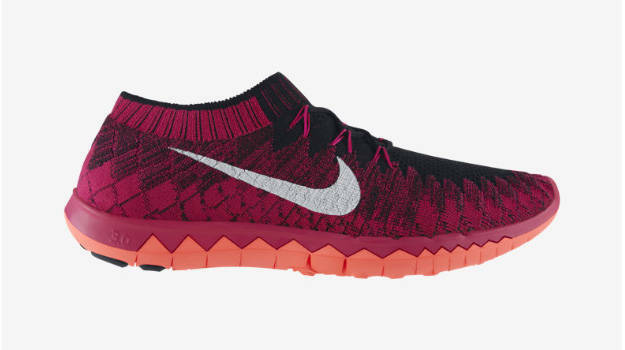 The Nike Free 3.0 Flyknit is the most flexible footwear out there for runners. It was designed to make you feel as if you are wearing socks, not an actual shoe. The shoe is very lightweight and is made with mesh materials that are woven to produce the same tight secure feeling as the harder mesh or leather would. This shoe promotes a natural running stance and doesn’t drag you down due to additional weight from thick rubber soles. 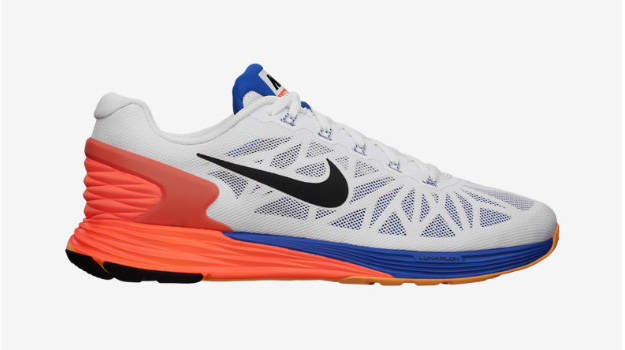 Nike LunarGlide 6 is a very stable sneaker from Nike’s running category that can also be used as a training shoe. It’s really great for all types of workouts. The most surprising factor about this shoe is that dual mid sole that consists of Phlon and Lunarlon that works together to offer a highly stable and responsive stride. The shoe is also designed for extra cushion and comfort for a breathable fit. Nike Free 4.0 Flyknit was named Runner’s World 2014’s “Best Update” by far. The updated Flyknit truly stepped up it’s game compared to other brands of athletic footwear. It gives a sock-like fit that is supported by multiple Flywire cables on each side. The shoe also features a 6mm offset from the heel to toe providing your forefoot closer to the ground. This mimics are more natural stride. This shoe is a beast and definitely one to consider. So, there you have it. Those are the top rated Nike shoes as provided by many different polls around the Internet. It’s important to remember when picking out footwear for an active lifestyle that you do your research for which style and design is right for your active lifestyle needs. In conclusion to this article, I would like to say that I personally can say with pride that all of these Nike products I have mentioned today I have used and absolutely love. Nike is a high quality brand that never disappoints, so if you are considering purchasing any Nike product, I give you the green light.